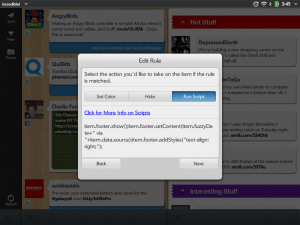 Creating rules in incredible!, by Zhephree, is a rather easy task. These "rules" can help you determine how specific posts show up in your timeline (or hidden from it altogether) and can be based on the Author of the post, the social network service, a specific account within that social network if you have multiple, or based on the content of the post itself, and then you determine the outline color of that post or if you want to hide it from your timeline. Swipe down from the top-left to show the "Application dropdown" menu and select "Manage Rules"
Name the Rule, such as "Show app info" and then choose "Save"
You can also prepopulate a few steps above by finding a post in your timeline from twitter, press-and-holding on the post to bring up a pop-up menu, choosing "Create Rule from This…" and finally choosing "Service" in the first pop-up. This will pre-fill in the "twitter" piece in step 5 above.